Tampa Bay Lightning forward Martin St. Louis finally had his signature moment in his candidacy for the Art Ross Trophy on Wednesday night. 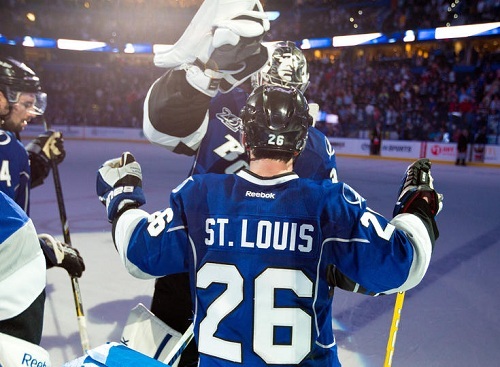 St. Louis recorded his seventh career hat trick, vaulting himself into the NHL points lead and helping the Lightning pick up a 5-2 victory against the Toronto Maple Leafs. The Art Ross, awarded to the player with the most points in the NHL, seems to be St. Louis’ to lose in the final two games of the season because Pittsburgh’s Sidney Crosby — who has been out since March 30 after breaking his jaw — and Steven Stamkos are his two closest competitors. Crosby is not expected to return before the playoffs and Stamkos and St. Louis could match each other point for point because of playing on the same line. St. Louis has 58 points; Stamkos and Crosby have 56. “I’m pretty fortunate to be able to see him every day and see how hard he works and how much he wants to be the best player that he can be,” Stamkos said. If St. Louis, 37 years old, wins the Art Ross, he will be the oldest player ever to lead the NHL in scoring for a season. Stamkos scored the first goal for the Lightning, receiving a Nate Thompson pass on a breakaway and beating Toronto goalie Jeremy Reimer (21/25). Stamkos’ goal, his 29th, brought him within two of Washington’s Alex Ovechkin in the Rocket Richard goals race. Stamkos’ goal, which tied the game at 5:54 in the second period, came after Phil Kessel (17) opened the scoring by beating Ben Bishop (26/28) thanks to a Matt Carle turnover. St. Louis’ first goal (14) gave Tampa Bay the lead; he picked up a Thompson rebound and beat the out-of-position Reimer. Joffrey Lupul (11) quickly tied the game following a miserable defensive zone turnover by the Lightning, sending the game into the third period tied at two. The Lightning were not intimidated by the playoff-bound Maple Leafs, going onto score three goals in the third for the win. The game-winning goal came from an unexpected place — rookie defenseman Radko Gudas. Gudas picked up a deflected Teddy Purcell pass and blew it past Reimer’s shoulder at 3:13 of the third for the lead. St. Louis added his final two goals (15, 16,) in the final 6:52, including an empty-netter that clinched the hat trick, his first since February 26, 2012, against the New Jersey Devils. Martin St. Louis #26 of the Tampa Bay Lightning celebrates after their 5-2 victory against the Toronto Maple Leafs on Wednesday night. St. Louis recorded his seventh career hat trick in the game and took the NHL points lead away from Pittsburgh’s Sidney Crosby. This may have been a rough year to be a member or fan of the Lightning organization, but there is one thing that is certain. When they score, the Lightning are a fun team to watch. If St. Louis holds on in the points race, it will be nice to see a player like him rewarded for his hard work. This is the first time the Lightning have looked good under Cooper in quite a while, as the victory over Toronto ended a six-game losing streak for Tampa Bay. The Lightning will now head to the Northeast for their final road game of the season, tomorrow night against the Boston Bruins at 7:30 p.m. The game is a make-up of a snowed-out game between the two teams from February 9. Toronto will face the Florida Panthers tomorrow at 7:30 p.m. Toronto has two more games before playing in the postseason for the first time since 2004.